Lana's Life: You Can Call Me Lazy, but I Call Me Smart! You Can Call Me Lazy, but I Call Me Smart! 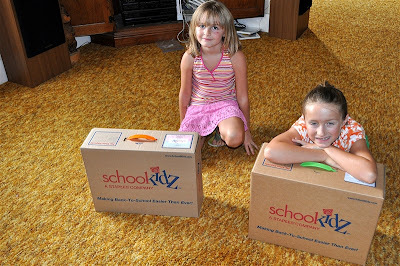 God Bless the person who came up with SchoolKidz supply kits. I absolutely DISLIKE shopping in crowds. I have only once ventured into the Day after Thanksgiving madness, and you will not see me out there again. EVER! 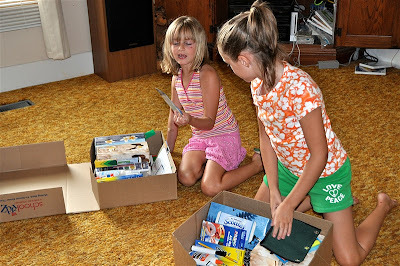 I LOVE this idea of buying the stuff ahead of time and picking it up all neatly boxed and ready for the girls to label with labels that are already made and included in the box. Yes, I know it probably costs a bit more, but my fuel and sanity are worth it! No arguing over what color the handle to the scissors will be, what kind of cool pencils to get, which markers they like the most, why can't I have a folder with Justin B on it? why so-in-so gets this and I don't.....Whew! See? The older I get, the wiser I am. This could save me a trip to the Oil of O'Lay aisle and spending even more on wrinkle cream! And probably one less trip down the wine and spirits aisle! Wish we had that here. I'm with u on this it'd b great and avoid alot of arguments! Where do u go to find a place that does the prepackaged kits? I am with you maybe we could do this for weekly grocery shopping. Or for Christmas time. I have never been shopping after Thanksgiving. Not my cup of tea I like the wide open spaces. Oh how awesome!! I've never heard of schoolkidz. I wish I had known about it 2 weeks ago! 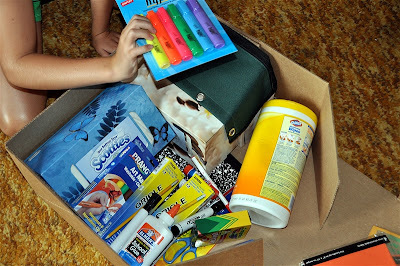 I just finished school shopping...ughh! Definitely checking it out for next year! We actually have a local school supply factory in our small town that offers something very similar to this. Love it! Never heard from them before (maybe has to do with the fact that i am not a mommy yet) but I think it is great! 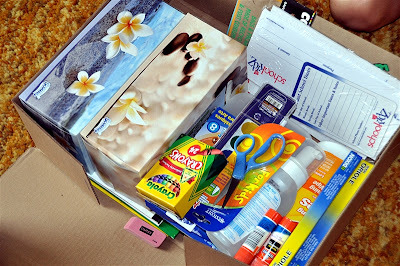 Today was the first day of school here (only half day) --so when we went shopping at Walmart, there were a zillion people in there buying school supplies. It was a zoo. SUCH a great idea!!! Can you believe it's time for school already? Wordless Wednesday! Woo Hoo School! HAPPY 50TH MOM AND DAD!